Three towers, dedicated to Shiva, Vishnu and Brahma respectively. The ruins are in relatively poor condition, and sit next to an active pagoda on top of a hill. Wonderful view of the Tonle Sap Lake and the surrounding countryside. 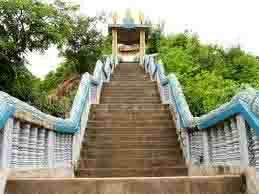 It is a very nice 15km countryside drive from Siem Reap, and an exposed, 20-30 minute walk to the top. A visit to Phnom Krom is sometimes combined with a boat trip on the Tonle Sap Lake.